Friday, Eli wrote about recent papers by Myanna Lahsen, and Naomi Oresekes, Erik Conway and Matthew Shindell about the Marshall Institute's founders, William Nierenberg, Robert Jastrow and Fredrick Seitz. Lahsen came to the conclusion that after retiring these three attacked climate science and scientists to make up for a loss of status. Oreskes and Conway thought not, in Eli's word's if for no other reason that Nierenberg was director of Scripps, and had built up climate science there and Jastrow hired Hansen and built up atmospheric sciences at GISS. O&C ask if they would kill their own babies. But at about that time, the director of GISS, Robert Jastrow, concluded that the days of generous NASA support for planetary studies were numbered, and he thus began to direct institutional resources towards Earth applications. The Marshall trio pushed the line that climate scientists are in it for the $$. Nierenberg, Seitz and Jastrow were simply reflecting on what they had done. One can also look for papers from a recent conference "Dissent in Science". Lahsen thinks that the three came to their positions through a combination of arrogance and their loss of status as they aged. In some respects Nierenberg, Seitz and Jastrow are representative of broader categories of which they are partly part. They share common characteristics with other physicists and with a particular subgroup of physicists and governmental advisors in particular, an older generation of elite physicists shaped by nuclear physicists. The Marshall Institute trio has lived through dramatic changes in popular attitudes towards science and the environment. Their engagement in US climate politics can be understood in part as a struggle to preserve their particular culturally and historically charged understandings of scientific and environmental reality, and an associated, particular normative order. The trio has found support for important dimensions of their worldviews and policy preferences within the backlash and among Congressional Republicans, but they must continuously contend with challenges to the privilege to which they had grown accustomed in science and government. this is a problem with physicists: they think they know everything, because they’re smart. What they don’t understand is that yes, it is true, actually meteorology is a branch of physics. And so you take a physicist, like me, and you can sit him down, and in 2 or 3 years, they could learn meteorology. But physicists confuse being smart and having the ability to learn everything with actually knowing stuff! But at about that time, the director of GISS, Robert Jastrow, concluded that the days of generous NASA support for planetary studies were numbered, and he thus began to direct institutional resourses towards Earth applications. Still, Eli has heard rumors that Jastrow left GISS when he ran afoul of regulations and was offered a Hobson's choice, without a doubt Nierenberg, Seitz and Jastrow were arrogantly proud, and Seitz was willing to front for the tobacco industry in return for power, money and visibility so he is not convinced totally of Oreskes and Conway's argument on this score. The political preferences of climate change "contrarians" including Singer, Nierenberg and Seitz can be characterized as anti-communist, pro-capitalish and anti-government interference. We agree. Indeed, philanthropist George Soros has given this perspective a succinct label: "market fundamentalism". Market fundamentalists hold a dogmatic, quasi-religious belief in unfettered market capitalism, and therefore oppose anything that restrains the business community, be it restrictions on the use of tobacco or the emission of greenhouse gases. There is something very peculiar about this, because many people believe in the merits of free markets but still accept the reality of global climate change. One can argue the merits or demerits of carbon taxes, emission control, carbon credits and all kinds of other potential responses to cliamte change without denying the scientific facts - and indeed all over the world people are doing just that. The Cold War however is over. We face now not a binary choice between communism and capitalism (if ever we did) but rather the realization that capitalism has had unintended consequences. When humans began to burn fossil fuels, no one intended to create global warming. But they (and we) did. Capitalism triumphed over communism, but now must deal with its own waste products. Well, not really a good translation. In Germany, screw ups on the football field are greeted by a heartfelt shout: Uben! Uben! Uben! or practice, practice practice. Eli is much in favor of this, but common sense is also needed. Tim Curtin springs to the defense of inanity over at Deltoid and criticizes Eli's take on the good Diplom Beck. Yves decks him by pointing to "Oxygen Deficiency in Antarctic Air" by Ernest Lockhart and Arnold Court that appeared in Monthly Weather Review. Starting from the conclusion of sod. . .
"they got CO2 concentration wrong by 200ppm at the worst! (and we don t really know what the real CO2 concentration was at the place they were measuring!" They, IMO, are mostly Beck and ZJ when making global conclusions from local measurements from primary authors whose first purpose were not always CO2 levels, even local (see for instance Lockhart and Court 1942 available in docs.lib.noaa.gov/rescue/mwr/070/mwr-070-05-0093.pdf, about ... oxygen depletion in Antarctica). which Eli had mentioned about a year ago. Eli is having the kind of week that Ms. Rabett goes revenge shopping during, possibly this will be a mite too strong, but it is exactly this sort of thing that differentiates the telephone book that Beck published, a critical review such as the IPCC report, or a decent scientific paper, like Machata and Hughes' "Atmospheric Oxygen in 1967 to 1970" Science, 158 (1970) 1582. We see the same sort of ingrained nonsense from the engineering types who insist that data analysis consists of simply writing numbers down without worrying what they mean and never, no never, evaluating if they make sense and what sort of corrections need to be made. Thus the recent spate of the world is cooling since 1998 naivety, be it put on or real, and bunny labs can make a pretty good guess at that choice too. In 1942 Lockhart and Court reported oxygen abundances in Antarctica averaging 20.92 percent by volume and suggested that the low values might be unique to the location. Glueckauf pointed out that they performed no analysis of normal non-Antarctic air to confirm their procedures. To further cast suspicion, their carbon dioxide abundances were many times higher than that found in recent times. Table 1 does not suggest lower values approaching the Antarctica (sic). The method that Lockhart and Court used had a resolution of 300 pppm for CO2 and 400 for oxygen. They found CO2 mixing ratios as high as 1700 ppm. For example between January 2 and January 4th they recorded values of 1700, 1500 (1/2), 1100, 900 (1/4) and 400, 200, 600, (1/55) 600, 700 (1/5 sample 2), 1600, 1400 (1/6). Think about what it would mean, if rather than a change in local conditions, or bad measurment methods or techniques, if this had really been a change in the background level of CO2 in the atmosphere. As Tonstant Weader knows, Eli has found the Good Diplom Beck a bit too hummy. Bunny Labs has had a word or two or three or four to say about Ernst-Georg Beck who never met a CO2 measurement he did not accept as representative of the background atmosphere, especially when it was taken in the middle of Paris or some other large city, which as we all know has a bit more CO2 in the air, then in your average fizzy beverage of choice. The Rabett is not the only one to notice this, so has Coby Beck, as has Tim Lambert, as has Stoat (see we only disagree about how much ice to put in the Scotch, Eli says none for the good stuff) and as has Real Climate, in a post titled Beck to the Future, Eli believes one of the first times the eminent scholars over there were so enraged they resorted to punishment. Having misplaced an early copy of Becks manuscript, 180 Years of Atmospheric CO2 Gas Analysis by Chemical Methods" Eli didn't have the carrots (you guys better pay attention to those ads on the top left) to penetrate the Energy & Environment paywall, but, good fortune, it now has reappeared on Beck's Blog, together with some comments published in E&E by Harro Meijer and Raph Keeling, CD's son, and a pretty good atmospheric scientist himself. It is shocking that this paper has been able to pass the journal's referee system. "Energy and Environment" apparently has been unable to organise a proper peer review process for this paper, thereby discrediting the journal. All these measurements by David Widory and Marc Javoy (reference below) were snapshot measurements, but they show how CO2 concentrations can vary strongly due to nearby fossil fuel combustion. The criticism that my paper presents no evidence for loss of gains of carbon makes sense, but this was not the subject of the paper: it is restricted to quality assessments of the selection of old data. Beck says that according to those truly excellent 90,0000 CO2 titrations by Nobel Prize Winners!!!! using chemical methods, CO2 went from 310 to 420 ppm in 25 years. Keeling notes that this requires an enormous release of carbon, one that no one has noticed, but that surely WOULD have been noticed. In polite seminars, this is called a Bull Chocolate Test, aka inducing a GOGI situation, if you get garbage out, you put garbage in. EGB is not one to notice that the thing melted in his hand. It is surprising, that the old data suggest a variability of the sizes mentioned. If, however, the base line over the period 1800 to 1950 was at a higher level than the generally assumed pre-industrial level of 280 ppm, then the swings reduce. There seem to be many aspects of the carbon cycle which are insufficiently resolved (e.g. the up welling from the deep sea in equatorial waters, a major source in natural cycle). Another aspect that seems to be neglected to date is that ice core data may indicate a too low CO2 value because of the presence of CO2 fixing bacteria (see Table 1 in Christner et al.). It should be noted that the fundamentals of my assessment of the quality of the old measurements has not been challenged by RFK or by Meijer. which, in case anyone is still paying attention, was because they did not have to do that to show that what was being measured was not what Beck (and those who did the measurements) thought they were measuring and besides which, if you know the literature, has already been done. ** Garbage out, garbage in, a very common way that scientists think about things. If the result is beyond belief, so were the assumptions on which it was based. Eli will now hie himself over to the Wikipedia. 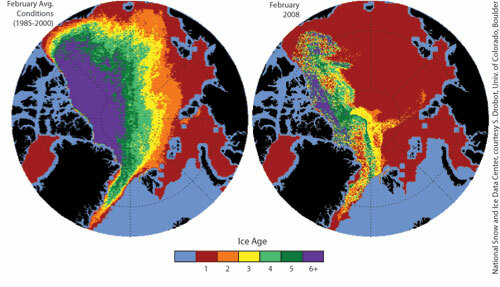 One of the mice, cce, suggested that Eli put up this image from the NASA there ain't no old ice today news conference. Some things speak for themselves but Eli would remind gentle readers that the reason the bunny risked a couple of beers with Stoat was that the easiest place to reach a new extreme from is from a new extreme, especially if the system has some memory. Eli has had an idle thought. If you google "Sheep Mountain CO2 strip bark" you will hit the motherwave of denialist froth centered on the dendrology of very old trees high up in the Sierra sampled by Graybill. You could also add Campito, which is a bit to the north. Both can be found in the International Tree Ring Data Bank housed on line by NOAA. Now, being a curious bunny, Eli wanted to see where this was, and he had a map from "Trends in twentieth century tree growth at high elevations in the Sierra Nevada and White Mountains, USA from Bunn, Graumlich and Urban to go on. The area looked familar, so he looked it up on Google maps, and wadda you know, Sheep Mountain is right across from the Long Valley Caldera. This may not mean much to the sheltered readers of this blog, but veterans of the CO2 comes from volcanoes nonsense will recognize Long Valley as the largest geological source of CO2 in the US, and pretty close to being the largest geological source anywhere until the next Pinatubo goes off (which may be at Long Valley:(. A lot less than a zillion tailpipes but not zilch. Making the not so dumb assumption that winds move the CO2 from the caldera west up onto the mountain the case for CO2 fertilization looks pretty strong. OTOH, the level there could be a lot higher than normal and could have been so for a long time. Instead of “spatial” and “temporal,” try “space” and “time.” When you talk about trends in degrees per decade, you are asking people to do math in their heads. Instead, try giving the total change over the full period of time. And know your audience; always use Fahrenheit for Americans. Well yeah, but no ethical scientist uses Fahrenheit. Yet then we come to the most important part. to lay people, enhance means to improve or make better... So the “enhanced greenhouse effect” or “enhanced ozone depletion” sounds like a good thing. Try “intensify” or “increase” instead. I suggest avoiding the use of the word “theory” to refer to things as well established as the greenhouse effect or the human intensification (not enhancement) thereof. Eli went up to Philly today and returned with carrot gelato from Capogiro, something you should consider when there, or order some by Email. Ms. Rabett welcomed him home with spoon in hand. So, constant reader, you ask, what about the ice up north. Perking along thank you, a lot of really thin stuff set to vanish when it warms a bit. You can get an idea of this by looking at the comparison between the low ice at the beginning of September and the ice today from Cryosphere Today. You might also notice that a lot of the "extra" ice from this winter is in the Sea of Okhotsk and the Bering Sea, up there at the top and especially the Davis Strait between Canada and Greenland. Stuff that will be gone soon, but pay attention to the coloring, the bright purple stuff is only 80% coverage. discussing how the old ice is flowing out of the Arctic, into the Atlantic, driven by the Arctic oscillation. Lots of figures, photos and the entire NASA news conference are available. Eli has a bet with Stoat, and an in with Santa, the Easter Rabett and St. Nick are in the same line of business. Watch S. Fred play telephone. You know, the game they learned at the N3xus6 School of Denial in Lesson Two, (excerpt to the right), where you get a bunch of denialists in at a conference sponsored by the Heartland Institute and they start makin' it up and then in Lesson Three, they start passin' it on. Zbigniew Jaworowski [1994, 1992] has repeatedly pointed to the unreliability of ice-core data to establish pre-1958 CO2 concentrations, thus creating doubt about the magnitude of the human contribution to the current atmospheric CO2 concentration. Ernst-Georg Beck, by assembling more than 90,000 pre-1958 measurements of atmospheric CO2 dating back to the nineteenth century, has shown rather large variations, including a major increase roughly coincident with a rise in ocean temperatures from 1920 to 1940 [Beck 2007]. Others have disputed the significance of these measurements; the issue has not yet been fully resolved. No better explanation gives of why vorpal blades are needed to finish off the Climate Jabberwocks and the difference between a telephone book (the Nonsensical Summary for Bad Climate Policy) and the IPCC Fourth Assessment Report, an expert critical review. About a month ago, Eli made a serious error in expanding a function from which he has received a serious amount of grief. I suppose the point being that the rabett hole has its uses. 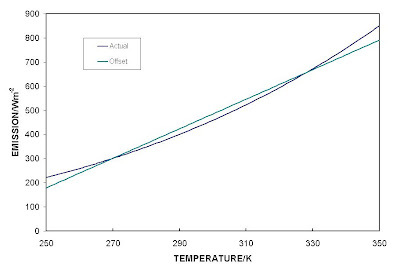 The point was to show that there was little difference between using a linear function for modeling thermal emission and a function which varies as the fourth power of the temperature. There was a graph at the end which showed that this was true, but it got lost in the forth and back. which is what we originally showed as the best linear fit. as guthrie put it. Eli has started throughFred Singer's Nonsensical Summary for Bad Climate Policy. You gotta understand, forcing somebunny to read this thing straight is what the CIA substituted for waterboarding, but it is such a rich source of chocolate (thanks Fred) that it is hard to resist. So what to fisk, what to fisk, oh yeah on page 19. Measurements of increased ocean acidity give us little additional information about the sources of CO2 increases. Strawman alert!! Strawman alert!! Strawman alert!! Strawman alert!! Although higher concentrations of carbon dioxide reduce the pH of the ocean to some degree, it still remains slightly alkaline; pH values range from 8.2 (in the Norwegian Sea of the North Atlantic) to 7.9 (in the Eastern Pacific and Arabian Sea) [Doney 2006]. Ocean pH varies between oceans, the pH remains slightly alkaline. What we don't see is that the average pH has decreased by ~0.1 units since 1750 which corresponds to a 30% increase in [H+] concentration (e.g. acidity), that various types of sea life are well adopted to the local acidity and sea temperatures and not so for the changing ones. Poor Eli, doomed to disappointment, he went and RTFR only to discover that S. Fred was dissembling, no, actually he was flat out selling male milk chocolate. Anthropogenic-driven accumulation of carbon dioxide in the atmosphere and projected ocean acidification have raised concerns regarding the eventual impact on coral reefs. This study demonstrates that skeleton-producing corals grown in acidified experimental conditions are able to sustain basic life functions, including reproductive ability, in a sea anemone-like form and will resume skeleton building when reintroduced to normal modern marine conditions. These results support the existence of physiological refugia, allowing corals to alternate between nonfossilizing soft-body ecophenotypes and fossilizing skeletal forms in response to changes in ocean chemistry. This refugia, however, does not undermine the threats to reef ecosystems in a high carbon dioxide world. We share Stanley’s concern that our findings might be misinterpreted by the reader, as the title suggests “survival.” The last sentence in our paper, however, clearly states that while we discovered physiological refugia for corals under acidified conditions, coral reefs and their services will be lost. Corals without carbonate skeleton do not provide protection from predators to both the coral host and the numerous species that are associated with it. So even if corals survive acidification, reefs will not. Physiological, versus geographical, refugia may provide a broader explanation for the existence of corals during times of stress. It is important to note that although survival as soft bodies allows corals to persist, substantial decalcification of reefs will cause major changes to the structure and function of coral reef ecosystems and the services they provide to human society. Technically the nanomules are called corals, and what they build are the reefs. At least some of the corals might survive without their shells, but many would become fish food. Worse, F&T did not look at all possible corals and many may not be able to survive without shells. A few bloggish links provided, most have contact information but time is a wasting. Feel free to fisk the sucker. Rabett Labs notes that several of these authors tried to play with the big boys and got slammed. "Proof of the Atmospheric Greenhouse Effect". 1. An average surface temperature for a planet is perfectly well defined with or without rotation, and with or without infrared absorbing gases. 2. This average temperature is mathematically constrained to be less than the fourth root of the average fourth power of the temperature, and can in some circumstances (a planet with no or very slow rotation, and low surface thermal inertia) be much less. 3. For a planet with no infrared absorbing or reflecting layer above the surface (and no significant flux of internal energy), the fourth power of the surface temperature always eventually averages to a value determined by the incoming stellar energy flux and relevant reflectivity and emissivity parameters. 4. The only way the fourth power of the surface temperature can exceed this limit is to be covered by an atmosphere that is at least partially opaque to infrared radiation. This is the atmospheric greenhouse effect. 5. The measured average temperature of Earth’s surface is 33 degrees C higher than the limit determined by items (2) and (3). Therefore, Earth is proved to have a greenhouse effect of at least 33K.